Idaho National Laboratory has gotten off to a fast start with the U.S. Department of Energy’s Lab-Corps program, designed to guide innovation at national laboratories into the world of commerce and industry. Four INL teams participated in earlier rounds, and six INL teams will participate in the program’s third and fourth rounds this summer and fall. DOE’s Office of Energy Efficiency and Renewable Energy (EERE) created the Lab-Corps program in fall 2014 to help research scientists and engineers explore new ideas for meeting the needs of industrial users. “DOE’s Lab-Corps program offers a new pathway to advance greater collaboration between industry and national laboratories,” said Steven Aumeier, an INL associate laboratory director and director of the Center for Advanced Energy Studies (CAES), a consortium that involves INL, the state of Idaho, Idaho State University, Boise State University, the University of Idaho and University of Wyoming. Lab-Corps teams participate in a seven-week entrepreneurial boot camp, or “cohort,” facilitated by the DOE's National Renewable Energy Laboratory (NREL) in Golden, Colo. This involves in-person sessions and weekly webinars to help teams learn how to evaluate the market potential of their technologies and bring a new level of entrepreneurial awareness back to their research and colleagues. One team has been chosen to participate in the summer 2016 cohort. It is led by Jake Gentle, an INL power systems engineer who also led development of GLASS (General Line Ampacity State Solver), a software package developed to calculate the effects of weather on power lines so operators can manage transmission for maximum efficiency and savings. Bioenergy Conversion Process (principal investigator Allison Ray), which allows researchers to produce high-quality feedstock from grass, wood and agricultural residues. CellSage (principal investigator Kevin Gering), which involves deploying software to support battery performance and life-cycle determinations in diverse applications. Electromechanical Recovery of Metals from Electronic Waste (principal investigator Tedd Lister), which retrieves critical and rare earth materials from such devices as cellphones and computers. Change Detection Systems for Nuclear Applications (principal investigator Troy Unruh), a computer software program that aligns digital images for nuclear facility and national security applications. Online Condition Monitoring of Spent Nuclear Fuel Dry Cask Storage Systems (principal investigator Ahmad Al Rashdan), which enables the non-invasive determination of the status and integrity of vented dry casks. With competition from as many as 17 national laboratories, the first hurdle for participation in Lab-Corps is being selected. Each lab proposes one or more three-person entrepreneurial teams consisting of a principal investigator, an entrepreneurial lead and an industry mentor. In the first two cohorts, 14 teams from seven national labs were selected. During the training, DOE assesses the viability of each team. This is done by an impartial panel of clean energy commercialization experts comprised of three representatives from private industry or venture capital and one from NREL. Scores to inspire continued improvement are given based on weekly presentations and rigorous questioning. The other basis for performance evaluation is the number of interviews each team manages to conduct with prospective customers or collaborators. While the program’s aim is to teach researchers how to take their work to customers outside the national laboratory complex, Lab-Corps is also aimed at making national labs more accessible to businesses, said Tammie Borders, industry outreach coordinator for CAES and INL’s Energy and Environment Science and Technology Directorate. 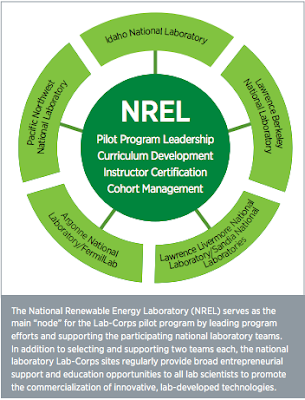 For more information about the Lab-Corps program, visit http://energy.gov/eere/technology-to-market/lab-corps.